See exotic creatures from the deep and learn about Dubrovnik’s maritime history at a family friendly attraction inside a colossal fort. Venture inside the monumental St. John’s Fortress to explore the Dubrovnik Aquarium and Maritime Museum. Exhibits are spread across three floors of this medieval structure which protected the city’s harbor for more than five centuries. See tanks filled with fish that are native to the south Adriatic Sea and discover how maritime trade fueled the growth of the former Dubrovnik Republic. The aquarium is located on the first floor of the building. Observe moray eels, octopuses, sea horses and an abundance of other species. They are housed in tanks that are fed by streams of fresh seawater. Many of the tanks are situated in niches in the fort’s old stone walls. Head to the second and third floors for the Maritime Museum. During its golden age, Dubrovnik was a wealthy merchant republic and one of Europe’s most powerful maritime regions. Exhibits chart the rise and development of Dubrovnik Republic and its shipbuilding industry. Study displays of old atlases, maps and navigational instruments. Observe paintings of sea battles, ships and important naval figures. Examine scale models of steamships and sailing ships and browse the collection of sailors’ uniforms. Among the other exhibits are anchors, canons, objects retrieved from shipwrecks and a traditional ship’s wheel with its cylindrical wooden spokes. The Dubrovnik Aquarium and Maritime Museum is situated in the old city port and can be reached by going down a side street opposite Dubrovnik Cathedral. There are separate entrances to the museum and aquarium, but the admission fee covers access to both attractions. They are open every day except Mondays, with extended opening hours in the summer. As you leave the fort, look back to appreciate the size and scale of the stronghold and the city’s old stone defensive walls. Relax on the sand, take part in watersports and enjoy coastal walks at a picturesque stretch of coastline at the heart of Dubrovnik’s seaside scene. Enjoy an afternoon in the sun at this popular beach, a well-equipped stretch of coastline with lots of activities for all ages. Start your tour of Dubrovnik’s old town by walking through this majestic entrance, once an important defensive structure. Dubrovnik’s main harbor is a popular destination for its daily fresh food market and is a launch point to nearby islands. Escape the busy streets of Dubrovnik to spend a day exploring the natural and historical attractions of an island that lies just off the city’s coastline. Admire the architecture of this stunning 16th-century building and visit its poignant memorial of the Croatian War of Independence. 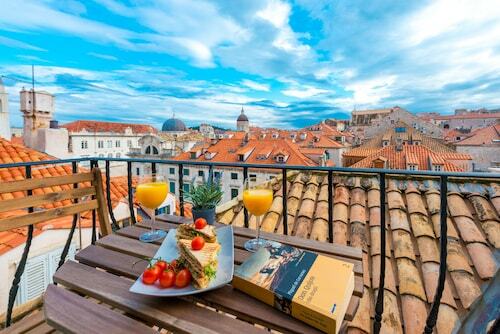 Stop for a refreshing drink at this much-loved Dubrovnik attraction, an important hub of city life for centuries. Discover some of Dubrovnik’s most famous historic attractions when you wander along this lively pedestrianized street, the old town’s main thoroughfare. Beautiful frescoes, baroque architecture and a grotto await visitors to this 18th-century church, dedicated to the founder of a religious order. Admire the architectural beauty of part of Dubrovnik’s medieval fortifications, a 15th-century stronghold that dominates the southwest corner of the old town. 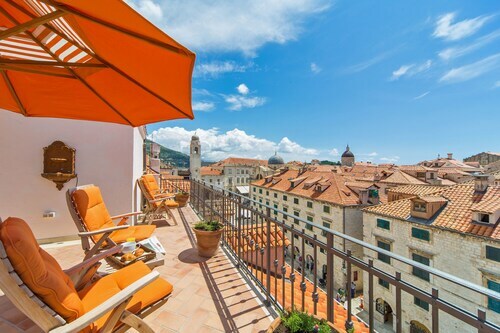 The former power base of the old Dubrovnik Republic has survived a turbulent past to emerge as one of the city’s most beautiful buildings. Step inside this early 18th-century church devoted to Dubrovnik’s patron saint to see one of the city’s most worshipped religious icons. Spend some time in a historic monastic complex, home to an outstanding museum of religious artwork and a well-preserved gothic cloister. Explore this 18th-century cathedral to see its impressive collection of art and religious relics, including remains of the city’s patron saint. A large, 15th-century fortification built outside the city walls is now a museum, concert venue and nightclub. Climb the steep stone steps to reach this formidable fortress and to enjoy some of the most dramatic views in the city. 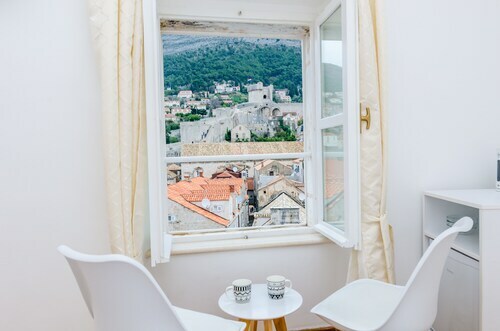 Go to the top of this 14th-century stronghold to experience spectacular views of Dubrovnik and the Adriatic Sea. The closest beach to the Old Town has great views, clear water and a stylish restaurant and nightclub. Tour this tiny and unassuming old church which survived the historic earthquake that levelled much of 17th-century Dubrovnik. Learn about the origin and development of the Jewish community in Dubrovnik when you visit this small synagogue and museum. 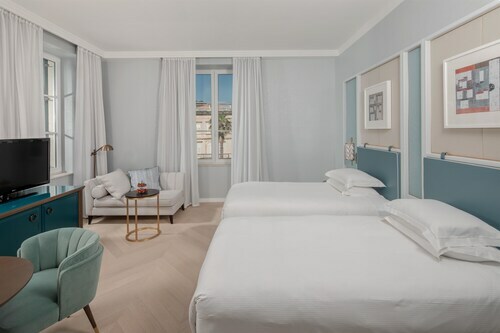 Amazing room, unparallel views, walking distance to the old city, friendly welcoming staff who take their commitment to making your stay memorable very serious. I cannot think of a single thing to change. We will definitely be coming back. The location was great and the hosts were very kind to us. The bed was comfortable, the bedroom was pretty and clean. We encountered problems with the fridge though. 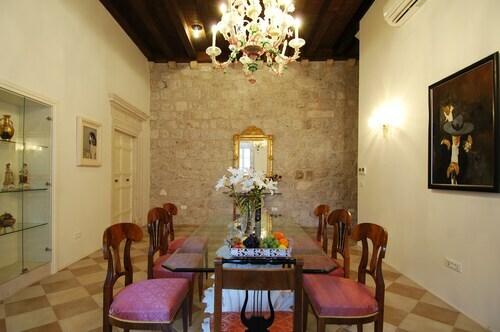 Located in Dubrovnik Old Town, this apartment building is steps away from Dubrovnik Synagogue, Sponza Palace and Rector's Palace. Dubrovnik Cathedral and Pile Gate are also within 5 minutes. In an excellent location , very clean and airy. Good breakfast selection and the staff were very friendly and helpful. Would definitely recommend and hopefully we will return again in the future.